In-Flight Interface: "Are we there yet?" Fresh off of holiday flights with my 18-month-old daughter in tow, I'm especially appreciative of anything that made the experience better. So my thanks goes out to Delta for a superb in-flight entertainment system: not just the selection (Hannah enjoyed Ratatouille as seen above, among others), but the interface was helpful - even clever. Circled above is the critical info I kept wanting to know - the time to arrival - which popped up without having to stop the movie. 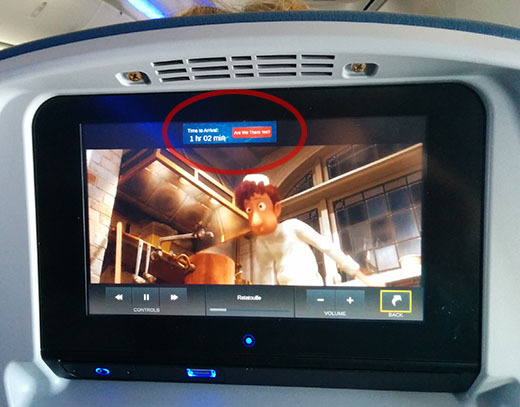 We even noticed that when watching movies from the general selection, that red button is labeled "Flight Info" - but when watching kids' movies, it's "Are we there yet?" It was a little extra nugget of delight in a long flight that needed it!